As tradition mandates, every 11th day of the month of March following the election of a new president, Chile celebrates the inauguration of its new Chief Executive. In 2014, Michelle Bachelet becomes the first president to be inaugurated for a second time since the return of democracy in 1989. She takes the reigns back from Sebastián Piñera, who governed the country for the last four years. 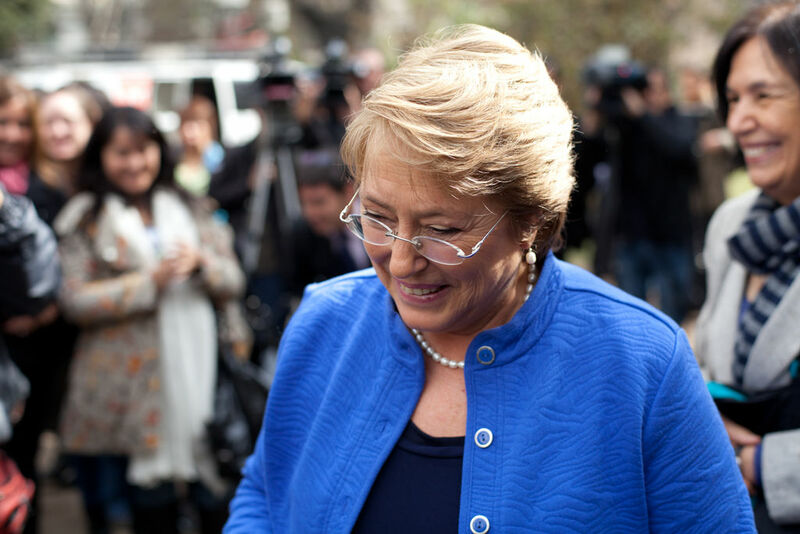 Bachelet won the runoff election held on December 15th, 2013 by a landslide, defeating the right-wing coalition candidate, Evelyn Matthei, by a margin of 24 percentage points, 62% against 38%. This marked the end of the right-wing rule of the executive after only one term in power. At the same time, Bachelet’s coalition won a majority in both chambers, making the potential implementation of changes somewhat easier. While Matthei’s campaign focused upon the continuity of Piñera’s government, Bachelet centered on fighting several problems that have been recurrent for previous presidential terms (including her own): the improvement of education and the writing of a new constitution. Regarding the first point, after the “revolution of the penguins” of 2006, students have made their way into policy debate through protests and remarkable work from student leaders. Their biggest advocates back then were Camila Vallejo and Giorgio Jackson, who gained popularity and are now elected deputies for the period 2014-2018. Even though they support more radical changes than the elected president, Vallejo and Jackson can now help Bachelet from the legislature. Concerning the second point, the Chilean constitution has been the subject of debate because it still protects some of Augusto Pinochet’s “authoritarian enclaves,” thus delaying the democratic consolidation process in the country. Because it was written during dictatorship, the constitution has a problem regarding its legitimacy of origin. Even though nothing guarantees that a constitution written in democracy will be better than the one already in place, and the existing one has not been problematic during its three decades, the lack of legitimacy is enough reason for some actors to demand a new constitution. Despite being an insider, Bachelet has captured some of the dissatisfaction that people feel toward institutions such as political parties and the Congress. And the promise of structural change is both consistent with the times and enticing because it is actually possible. However, it is hard to anticipate a fulfillment of those promises, mainly due to two factors that have maintained (and probably will maintain) a climate of status quo in the political arena: the right-wing coalition will force gridlock in many reform projects due to the requirement of super-majorities to approve some law reform projects, and a lack of political disposition from a left-wing coalition who learned to play the game with the rules that the right put in place during the dictatorship. This last point can become clearer after realizing that the Concertación was born primarily as an electoral pact to defeat Pinochet in the 1988 plebiscite election, but evolved over time to become the most popular coalition. The inclusion of the Communist Party and the re-naming of the pact to Nueva Mayoría in 2013 does not change the fact that the coalition that swept every election last October has basically the same historical members as in 1990, and remains quiet about changes that are probably more urgent than a new constitution. At the same time, over the course of four presidents, it only expanded the neoliberal economic system put in place by the dictatorship, even though they are on the opposite side in terms of ideology. Consequently, this climate of rigidity seems to be the safest choice for two coalitions that have been able to absorb any outsiders while granting the system unparalleled stability over time. However, this immobility seems to be trading off the possibility for real change, something that students pushed for in the streets and Bachelet called for in her campaign. It remains to be seen whether her leadership and popular pressure are able to overcome the institutional obstacles for desired change. I'm a second year student from the Political Science department at Pitt. I'm interested in elections, political careers and comparative political institutions.